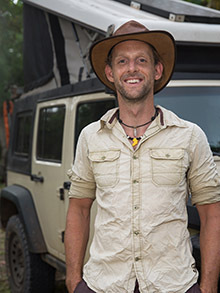 I have set out to drive my Jeep Wrangler around the entire African continent. The trip will cover approximately 80,000 miles through 30 countries over roughly two years. My name is Rosalía. My husband and I were doing the same trip as you. We are currently in Dakar and we would like to go to Bissau, Guinea Conakry, Mali, CI, ect. Wet season has already started and we want to know how roads are in Guinea before getting there… We drive a 4×4 with cellule so we carry a lot of weight. What do you think could be better going to Mali trough Guinea or Senegal? Thank you very much!! Best regards. Great to hear from you! Awesome yo hear you are on the road too! The roads in Guinea are B.A.D. Some of the worst I have seen. Massive potholes on the paved roads, and non-paved roads are very rocky. Not often muddy, more rocky. It is, however, spectacularly beautiul and I highly recommend it. Personally, I think you should go, and if the roads are too horrible for you, just stick to the highways – once you get about half way to the East, the highway is brand new and perfect. Have fun, let me know if you need any more info! Finally we went to Bissau and entered again to Senegal avoiding Guinea. After Senegal we went to Mali and Ivory Coast and currently we are in Burkina Faso near to the border with Togo. We stopped in Hotel l’Unité and a staff showed us a photo of your Jeep!! What a coincidence!! Hope you are well!! Best regards. That is awesome to hear, I hope you are having a fantastic trip ! That hotel was nice to find just as it was getting dark! How is border crossing, visas and corruption? What budget do you need for this? My plan was to do the same but with my vw polo tdi. You’ll have to read through my posts.. the visas are possible to get as you go, corruption is around but can be avoided if you have the right attitude, and budget varies greatly on how you want to live.. anything from around $1000/mo to $2500/mo roughly is what most people spend. For the west coast, you will struggle badly with a VW polo. Even the paved roads have huge potholes and speed bumps that you will bottom out on. Not impossible, but certainly a challenge! I was wondering, where did you send your Jeep to and from where when starting the trip? Ultimately I am looking at sending my vehicle to Morocco and would like to chose the cheapest port on that side of the world, can be Europe or Morocco. I would be sending from Alberta. I wish I can visit Africa one day. People say it’s beautiful. I can assure you, beautiful is an understatement! It really depends how far off the highway you want to get, and how comfortable you want the living quarters to be. Absolutely you could do the trip in a stock Jeep with no gear – stay in hotels every night and don’t explore the back roads. On the other hand if you want to camp, eat well, not buy bottled water and explore remote places, then a build like mine is a must-have (I think, personally). In terms of the best parts of my build, the water system is used 10x per day and I couldn’t do the trip without it. I love the fridge, the solar panels and the pop-up roof is excellent too. It really also depends if you are planned to go for a couple of months (you can tolerate no fridge and a ground tent) or if you want to go for years, when creature comforts really matter. I’ve been following your amazing journey for quite some time now. As many have said, it’s incredibly inspiring. The blog posts, photos and videos are great and give an insight into countries, some of which I know very little about. I’m hoping to be able to travel more in the future. For various reasons, it’s not practical right now. I have a family to think about so will wait until my daughter is out of school. I know many people travel with their kids but I want her to have a normal education. The plan is to save up and retire early to go travelling. My wife isn’t keen on the jeep idea but is up for travelling with a motorhome and I see there are 4×4 motorhomes that exit. I can see that a motorhome wouldn’t cut it on some of the roads you’ve been on, but you’ve made a point of taking some of the most difficult roads you can find! Do you think it would be possible to get around in a well kitted-out motorhome, or would this be impossible / impractical in some of the countries you’ve visited (not just Africa) and would it definitely need to be 4×4. I’m also curious about a couple of other things. Firstly, is there any particular reason why you missed out Sierra Leone and Ghana? Also, you mentioned in one of your posts (Mali I think) where you’re learning not always to trust government warnings. Can you explain a little more about this as this isn’t the first time I’ve heard this. Thanks for the kind words and feedback – I’m happy to hear people enjoy my writing and photos! Absolutely, many people drive AK-Argentina in motorhomes, and certainly East Africa is no problem in 2wd. It’s been done in a stretch limo! It really comes down to where you want to go, and if you want to get really, really far off the beaten track. Paved highways exist in virtually every country in the world, and if you slow down there is no reason a motorhome or van can’t be a great choice! I skipped Sierra Leon and Liberia due to safety concerns, though I kind of regret it now – I hear they are magical. Ghana wanted me to go to my home country to get a visa, and that was never going to happen so I just skipped it. Good luck, please don’t hesitate to reach out if you have any more questions! Thank you so much for the reply Dan. Great to hear that just about any country can be done in a motor home. Thought DRC might be a no go and there doesn’t appear to be another way through! I guess my only concern now would be security. 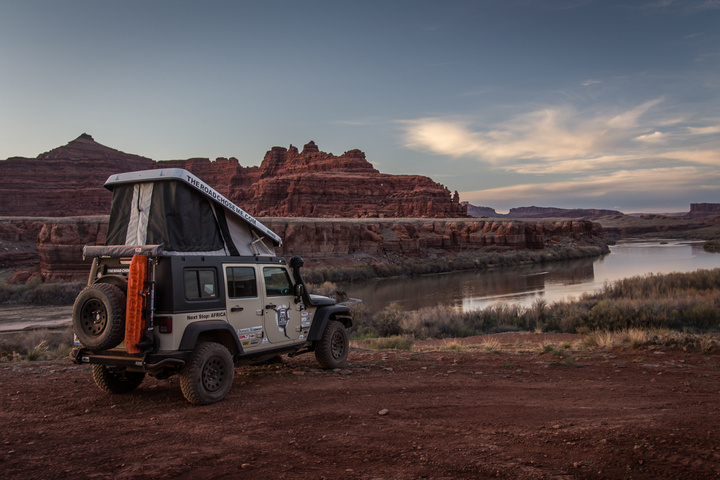 Do you worry about the jeep when you leave it behind for hikes, etc ? How do you minimize the risk? Sorry to hear about the visa for Ghana. I’m amazed you haven’t had more trouble with visas, though I can see you’ve put in a lot of advance research and know what you’re doing. Visa planning must be incredibly difficult though when plans are so fluid. Thanks for all the updates, photos and videos. The quality of the pictures are superb. Good choice of camera and the drone gives you some amazing shots too. Love the way you use it on your intro video.! There is a more conservative route through the DRC than the one I took. It’s a gravel road, but I’m told you can do it in 2wd no problems. Yes, the visas take some work and research, though I have done all the hard work for you and compiled it into an eBook! 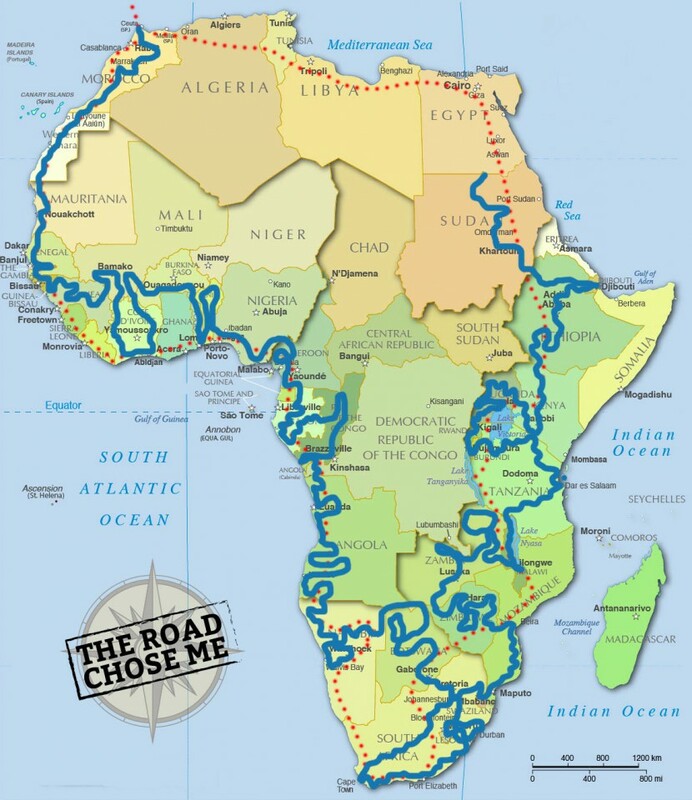 It contains everything you need to know to successfully traverse the West Coast of Africa including the visas (how much they cost and where to get them), gas and diesel prices, bribery information, safety and a lot, lot more. All the best on your planning! Thanks Dan. I’ll be sure to get the e-book. I don’t know if I’ll ever be in a position to do West Africa, but it’s a way to help support what you’re doing. Happy Travels! Hello, i heard in one of your videos you may be thinking of driving through the DRC again. Me and a friend are planning to to drive right across the DRC from East to west (entering from CAR and departing Rwanda or Uganda). We looking to do it Dec 2019. Do you want to plan together? That sounds like an amazing adventure! I would love to, though there is no chance of me getting back anytime in the next 5 years. My money will be completely gone and I will have to save before the next adventure. I have used absolutely all the modifications and gear, so many of them I rely on heavily every single day. 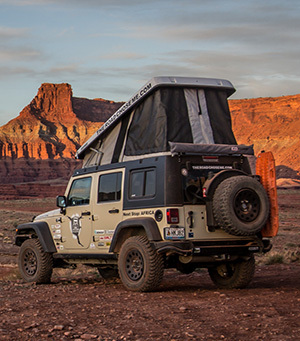 I think a stock Jeep could make it, but you’re not going to have a great time camping and things like that. Buying water would really add up. The water system is a lifesaver, as is the fridge and pop-up roof for a good night’s sleep. You are such an inspiration…my wife and I are just getting started with the over landing dreams. First East Africa, then Southern Africa and when we grow in confidence, West Africa and wherever else the road takes us. I have been following you on your journey and man I tell you, I have enjoyed your videos, watched them over and over. Will you be traveling through Rwanda by any chance ? If so, please do come through to my house and have dinner with us, stay at our house if you like …we would love to hear more about your stories. It would be truly an honor to host you. Journey mercies and keep inspiring us. Wow, thanks very much for the kind words, it really means a lot to me! Absolutely I’ll be coming through Rwanda at some point, I will fire you an email when I’m getting close. Thanks very much for the offer of hospitality, that is really kind of you!